This morning I bought my wedding shoes. …and could pin pretty shoes all day long on Pinterest, I’m a Converse girl at heart and when Dan told me “No!” to my request at wearing running trainers (several times) I knew wedding shoe shopping would be my least favourite pre-wedding activity! Dan and I are approximately the same height, and at 5’8″ I’m pretty tall anyway so have never been a fan of heels. Not only is it impossible to find flat shoes, but my feet also range anywhere from a size 8-10, (my current running trainers are a size 10.5! Eek!) and are also incredibly wide. 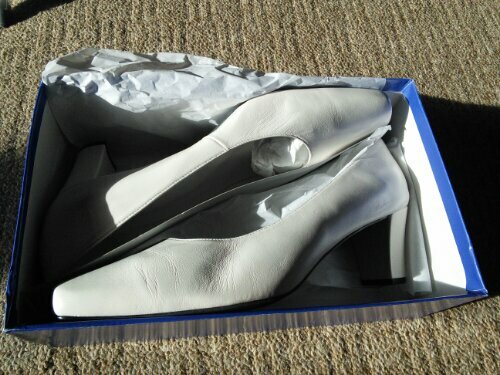 New Look size 9 tend to fit me, and New Look also offer a wide fit shoe, often being my saviour for work shoes. 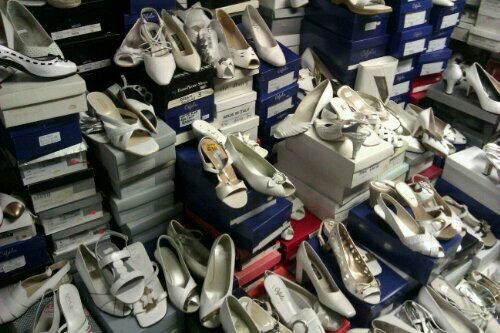 Before Christmas, Dan and I went to a wedding fair in Wellingborough where I happened to see a display of outfits alongside some larger sized wedding shoes. 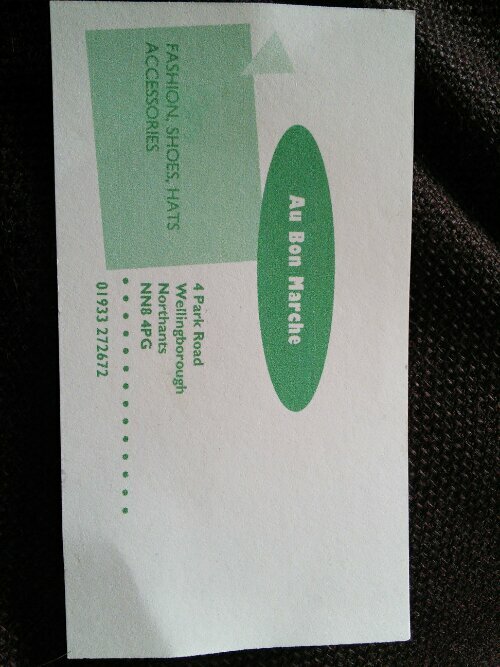 I enquired at the stand and the lady there said that she had just stepped in for a friend but gave me a card where I would be able to locate the store and check out the shoes in full. It’s been on my to-do-list for several weeks now, ever since the Wedding dress shop called just before Christmas to say that my dress had arrived and once I had my shoes to pop back in and get a fitting done. This morning I headed over as I had a few bits to get done in town anyway. It took me a little while to find the shop, but it was definitely worth it! From a tiny door on a side street I stepped into a narrow shop with fascinators and bags hanging from everywhere, even the ceiling! I told the owner my usual frustrations with shoes and followed him through a maze of ‘Mother of the Bride’ outfits for several minutes before we reached what I thought was the back of the store. It wasn’t even close to the back of the store! He unlocked another door and took me into a room filled with shoes. No word of a lie, the floorspace in that room was at least four or five times the floor space in my whole house! There were shoes EVERYWHERE! Neatly stacked up to the ceiling all around the outside of the room and then stacks and stacks of piles relating to different colours or styles of shoe. He stocked shoes right up to a size twelve! I’ve never known ladies shoes to be so large! The owner knew exactly what would suit my foot and pulled out several for me to try on. The ones I have gone for are quite plain, but at the end of the day, hardly anybody will see them under my dress! And at least that means I could wear them again. They do have a little heel so I might need to work on getting Dan to wear thick shoes for the day, so that we appear the same height again! 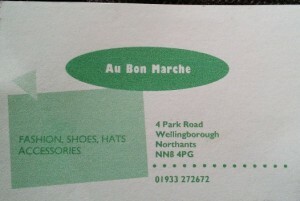 I would without a doubt recommend Au Bon Marche. Unfortunately they don’t seem to have a website though which is a shame. I ended up paying a little more than I intended for wedding shoes, but I know they are great quality and I cannot fault the service I had in the shop this morning. Now, off to do something less girlie and pound out a speed session at running club! Well done for getting those shoes- shoe shopping is the worst so at least you have that done now! IHATE shoe shopping normally so glad it’s out of the way! Haha, oh I would need a good run through the mud after being put through the experience of shoe shopping as well! I wish I was as tall as you! It’s a shame you couldn’t wear running shoes for your wedding (boo Dan, you party pooper! ), but you must get some fantastic deals having bigger feet. I’ve seen gorgeous running shoes at 1/4 of their original price when later models come out, but they’re only ever available in size 3 or size 9, or something like that. It’s no fun having size 4-5 feet like I do – you never get any good deals and always end up paying full price! I feel like I bit of a hypocrite… I literally posted on your blog about not being a girly girl then came on here to blog about shoes! I would have loved to have worn a new pair of running trainers in a pretty colour to the wedding but doesn’t look like that’s gonna happen. Can’t say I’ve ever spotted any great deals for my chunky big feet before. I always struggle to find something that fits to begin with and then stick to a certain shoe once I know it works for me. My current trainer is marked up at £110 though so I’m waiting for those to go on sale so that I can stock up again! yayyy! i htink they are perfect! like you said, barely anyone will see your shoes so go for comfort and practicability. And you can wear them again- even bettter! I just bought mine too… off a clearence rack for only $22 and I already wore them to my bridal shower and will probably wear them on many occassions. They are super comfortable which makes my runner’s feet happy! pss you are as tall as me! Yay! Glad I’m not the only 5’8″ runner out there! $22 is a great price and comfiness is key! Those shoes on Pinterest do look so pretty but I bet they were like $222!! I would recommend the most comfiest shoes possible! You’re on your feet for a fair bit of the day. I went for a very small heel and nothing fancy because, like you said, no one sees them! My sister went for ridiculously high heels and massively regretted them as her feet were so sore. Exciting! When are you getting married? Saturday 9th August is my wedding date! Just over six months away now.